Concerns have been raised for many years that some larger companies have been engaging in unfair payment practices in order to reduce their need to pay for commercial borrowing. Where a company requires suppliers to give them excessively generous credit terms, the companies in effect force smaller (sometimes much smaller) companies to lend them money free of charge. Although such large businesses are able to borrow money from banks and financial institutions at low interest rates due to their financial strength, their size makes it difficult for a supplier to walk away from the business and refuse the terms on offer. Smaller businesses are generally seen as less creditworthy and must therefore borrow expensively to finance any credit that they offer to their customers. As well as requiring generous trade credit arrangements from their suppliers, larger companies can also take much longer to pay than the agreed time. Administrative issues hold up payments, sometimes leaving smaller companies wondering whether the financial departments of larger companies treat it as policy to find reasons not to pay, rather than trying to help ensure that suppliers are paid on time and as agreed. Research by the European Commission has linked late payment of commercial transactions to a higher rate of business failure among financially constrained small and medium sized enterprises (SMEs). Late in 2017, new regulations came into force in the UK that require large companies to report upon their payment practices (large companies are those with at least two of: turnover greater than £36m, £18m on the balance sheet and 250 employees). Government's hope is that by bringing these practices out into the light of day, poor performing businesses will be shamed into improving their payment practices. A less optimistic view would be that companies will wear their 'tough negotiation' as a badge of honour. Time will tell which reaction to reporting prevails. The first reports were filed by businesses on 7th November 2017, giving just over six months worth of data to analyse, and comprising reports from 1718 companies. Reporting companies include household names such as Diageo, Aston Villa FC,PZ Cussons beauty, Triumph Motorcycles, Kier, Anne Summers, Sky, Sports Direct, JD Wetherspoon and Harpercollins to name a few. This is the average time taken to make payments in the six month reporting period, taken from the day the invoice (or other notice of payment amount) was received to the day when the supplier receives the payment. The average is based on the number of individual payments, not by the value of the invoices. 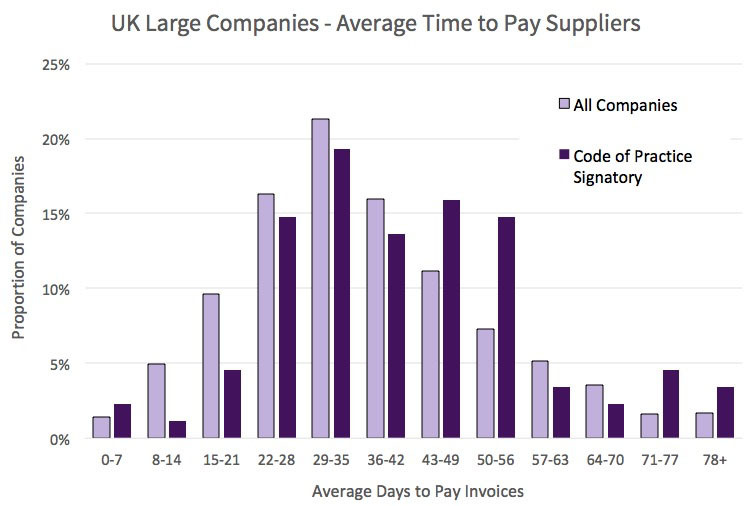 The median time to pay suppliers across the companies that have submitted reports to date is 35 days. While this may be seen as a reasonable credit term, there is a wide distribution and there are companies that take much longer to pay suppliers. 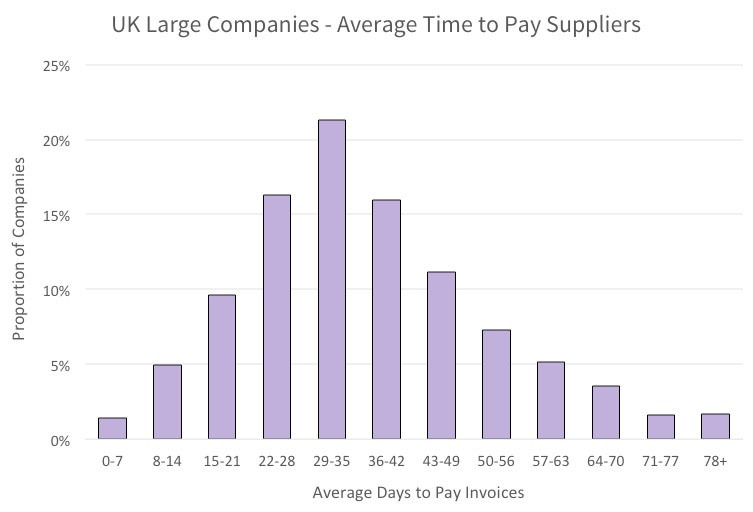 The twenty companies that take the longest time to pay suppliers are listed below and take around three times longer to pay suppliers than the average. Where subsidiary companies with the same parent appear more than once on the list we have only shown the worst performing subsidiary. We have also set aside companies with highly unusual trading arrangements (for example only paying invoices to a parent company). Top of the list and ahead of other companies by some margin is DS Smith Recycling, a part of DS Smith Group - a manufacturer of packaging materials. This company has standard payment terms of 94 days, but then takes nearly three weeks longer on average to settle its bills. Without the adjustment to show only the worst performing company across a group of companies, subsidiaries of DS Smith plc would occupy five out of the places on this list. Similarly for Greencore, the world&apos;s largest producer of sandwiches, which would have three companies in the top twenty. Aston Villa football club takes 89 days on average to pay its suppliers, with one third of suppliers having to wait beyond the agreed time for payment. Telcom company Telstra reveal that their longest standard payment terms are set at 45 days, but the company is taking nearly twice as long on average to settle their debts to suppliers, with fully 82% of their bills not settled in the agreed period. Diageo, the huge owner of drinks brands such as Guiness, Jonny Walker and Smirnoff pays only 1% of its suppliers within 30 days. 73% of its suppliers have to wait more than 60 days to get paid. At the other end of the spectrum are companies that pay their suppliers unusually quickly. In contrast to the companies at the other end of the table, these companies pay their suppliers in under a week on average and most have payment terms as short as 1 day from receipt of invoice. Top spot is shared by GATTACA and Fircroft Engineering Services Ltd. GATTACA is a recruitment services company that has standard payment terms of 7 days, pays suppliers in only 4 days on average and made 100% of all payments within agreed terms. Fircroft Engineering Services Ltd is also a recruitment company, placing people in specialist technical roles all around the world. The data also strongly suggests that the government's much-vaunted (and voluntary) Prompt Payment Code is not working. Only 88, or 5.1% of companies submitting data so far are participants, and worse still, the payment performance of these companies is well below average. Three of the twenty worst paying companies, Kier Partnership Homes, Diageo, and McNicholas Construction Services are participants in a payment code of practice such as the Prompt Payment Code. In fact, our analysis reveals that participants in payment codes are worse at paying suppliers promptly. 8% of payment code signatories have an average payment time longer than 70 days, compared to only a 4% of the companies in the whole sample. The data suggests that the governments voluntary payment code may not be producing the desired results. Another controversial practice that has come under scrutiny recently has been large businesses charging smaller suppliers a fee to remain on a preferred supplier list. One percent of the sample, comprising 18 businesses revealed that they had levied such charges in the reporting period. The list of companies engaging in this practice has a high proportion of companies from the food industry. Supermarkets have been criticised for poor payment practices including requiring payments from suppliers in the past and after public outcry have started to take steps to pay smaller suppliers more quickly. For example Tesco, Waitrose and Morrisons have all publicly announced that they will be paying smaller suppliers more quickly. No supermarket has yet reported its payment practices, so it is not possible to confirm whether charging suppliers to be on a supplier list is still common practice at supermarkets. The results suggest that the larger suppliers to the big supermarkets have passed on similar terms to their own suppliers in turn, an excellent example of how payment practices propagate down through the supply chain. The end of the line are the smallest companies, that are in no position to impose their own terms on suppliers, and must bear the burden of payment practice excesses.